Classic Elite Yarns: Do you want all 28 Booklets from our Fall 2012 Collection? Do you want all 28 Booklets from our Fall 2012 Collection? Of course you do! We have over 130 patterns being published this Fall, all wrapped up in a record-breaking number of booklets chock-full of gorgeous photography. And all those patterns could be yours! We are thrilled to introduce Spring-O! I hope you think it's as fun as we do. Here's how it works...Print out the official Spring-O scorecard from classiceliteyarns.com. Then start filling it in! All you need is one bingo (horizontal, vertical, or diagonal) to qualify to be in the drawing, but once you have one, why not go for the big one? One person will receive the entire Fall 2012 pattern collection--that's 28 booklets packed with new patterns, over 130 in all! Twenty-eight yarns are represented, including five new yarns that are still a secret. They will also get enough yarn to make one project of their choice! Ten additional entries will be chosen at random to receive all 28 booklets. Once you're a member, check out the Ravelry how-to page about adding projects. Don't forget to tag your project with the tag "Spring-O" so we'll know how to find it, and share it with the Classic Elite Knitters Group on the Spring-O forum thread. 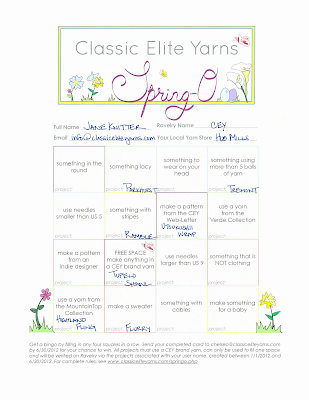 Click the image below to download a printable copy of the Spring-O board.